Septic Tank BiotechTerima kasih atas kunjungan Bapak / Ibu, ingin mengetahui produk Kami yang lain:1. Septic Tank Biotech2. STP Biotech3. Toilet Portable4. Bubuk Bakteri5. Tangki Panel 6. Fiberglass tub is a tub made of glass fiber is a synthetic material made of glass-reinforced plastic in the production process so that this material is not easily broken compared with ordinary glass products and aesthetically more beautiful and attractive than ordinary plastic products. Do you want to buy Bak Fiber? APAKAH ANDA SUPPLIER Bak Fiber? FIBRE TUBES350 LITRE ROUND TUBMaterial: FibreglassType: INTEGERSize:Outer size: 105cm T45cm he.Size: 100 cm dia. 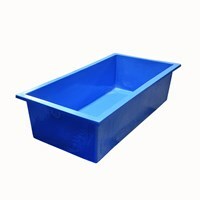 45 cm TNevel: 1 "
Fisheries can not only be done in ponds or ponds, but can also use fiber tubs. Both these fish fibers are made with large sizes with superior quality, so they are more durable and not easily leaky. Fiberglass is a glass fiber product that is widely used in various applications. Costank Fiberglass Tanki to make assembly the panel with methode to bolt. Grease Trap is a fiber bath used as a grease trap. This product is designed from pure fiber fiber so it has a high keraptan level. Fiber fiber is also widely used in various applications. We sell a wide variety of fiber products and manufacture custom fiber products on request. Is your Company engaged in selling Bak Fiber to Indonesia. Please Register your company here.